Whimsical streetlamps, avant-garde architecture, splashes of greenery ... sometimes, you don't have to be a psychiatrist to catch a glimpse of one man's psyche. In the vast, leafy expanse of the Agriculture Heritage Park of Malaysia's Putrajaya, a curious press photographer inadvertently committed durian murder. It's not as difficult as one might think. While the King of Fruits may seem menacing in its full size, all it takes is a single touch to end the life of a juvenile. “You're not supposed to touch the baby durian!” exclaims our tour guide, Yusriza Yusof, in response to the photographer's reckless move. He sighs, knowing full well that his warning came two seconds too late. Even though a durian is more fragile than it looks, it's still more resilient than a cocoa tree. Cocoa beans may taste nothing like Cadbury or Hershey's, but worldwide demand for it far outstrips supply, simply because it's one of the most difficult crops to grow. The flesh of an unprocessed bean is tangy and sour yet indescribably yummy, making it susceptible to attacks from insects and humans alike. That, I suppose, is the place's main objective: to educate those who don't know any better. It's more like an interactive orchard, where visitors are encouraged to touch, taste, see and smell all kinds of crops, from household favourites such as pineapple or pomegranate to lesser-known varieties like the sapodilla, noni or nam-nam. Given that Malaysia was once the top rubber-producing country in the world, a large section of the park is also dedicated to rubber trees - 1,400 of them to be exact. It's here that guests can witness the entire latex-manufacturing process, from tapping to smoking. “Do you know that all F1 tyres, jet tyres and condoms utilise genuine rubber because it is far more superior than synthetic types? Demand is very high right now. Unfortunately, no one wants to tap rubber anymore because it's hard work,” says Yusriza, as he gingerly slices one millimetre off the bark of a rubber tree. He swipes the milky, white substance off with a finger and holds it out to us. “Here, want to try some?” he offers. An old lady from the UK thinks it's delicious. For a city that looks like a dystopian science-fiction novella, Putrajaya is greener than one expects. There are more than a dozen parks in and around this city, although many of them are purged of visitors on a blistering weekday. “How can it be a city when there's nobody in it, eh?” asks an Iranian journalist. Make no mistake: there are approximately 70,000 inhabitants here. The figure may be way below the government's initial target of 350,000 inhabitants, but it's growing slowly and steadily as more and more civil servants partake in the great move that began in 1993, when Putrajaya became the country's new administrative capital. “I think we should be proud of the fact that it's actually one of 13 administrative capitals in the world,” announces Mohammad Salleh Hussein, or Sam, an articulate gentleman in his 70s who works part-time showing visitors around the city he so adores. Putrajaya was, incidentally, Perang Besar up until 1994. This name was given by a couple of sentimental British soldiers who had fought in World War I and purchased some land after retiring from the army in the hope of starting a rubber plantation. “The government probably changed the name when they realised it wasn't so conducive,” says Sam, adding that the idea for a new administrative city was not recent. 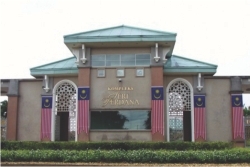 In the beginning, many civil servants were unhappy about resettling in Putrajaya, prompting former Prime Minister Tun Mahathir Mohamad to buy a home here. He wanted to set an example for others to follow. The Seri Perdana Complex - as the Prime Minister's official residence has come to be named - sits prettily atop a hill and overlooks some of the most breathtaking scenery in Malaysia. The sprawling building, which lies behind a high wall with beefed-up security, is a combination of Malay, Islamic and European architecture. No one can deny that it's a grand property built to serve a grand purpose. Over the years, the complex has welcomed a number of foreign dignitaries and heads of state, the most recent one being those from the Kingdom of Lesotho. “Parts of the building were open to the public until Tun Abdullah Badawi took over. Prime Minister Najib has since reopened these two blocks so visitors can see what it's like,” says the complex representative, Joe, leading me through a maze of imported furniture, old family portraits and expensive sculptures in the protocol block. “I don't think you'd be able to see the Prime Minister even if he's around,” assures Joe, who has not met Najib before, despite being a full-time employee at the complex. But while the Seri Perdana Complex may be Presint 10's most famous home, it certainly isn't the only expensive one around. Presint 10 is, in Sam's words, the “posh precinct” of Putrajaya. There are no high-rises here, only million-ringgit bungalows surrounded by well-tended lawns. Traces of colonialism are evident not just in our language or a street address, but also in our love for horse riding. The Equestrian Park, is Putrajaya's answer to Britain's Ascot Racecourse, minus the racing. It's a world-class equestrian centre with a sprawling polo field and a hundred stables. At the stables, we find a beautiful brown steed named Gatita, one of the 30 personal horses that are kept there. “Mahathir” - it is difficult to pass through Putrajaya without hearing his name mentioned a number of times. He is, after all, the man responsible for the city's blueprint, its skyline and its soul. In any case, Putrajaya is an amalgamation of everything Mahathir has seen during his travels and taken a liking to, from magnificent pavilions in Morocco, to the Champs-Élysées in Paris and the Bosphorus River in Istanbul. In Putrajaya, it is the 650 hectre man-made lake and wetlands that takes centrestage among other attractions. 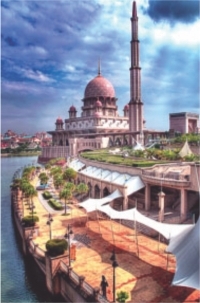 There are, however, plenty of other legal activities if visitors are looking to spend a day at the lake, including water sports (the lake has hosted a number of international waterski and wakeboard championships throughout the years) and the very popular sightseeing cruise that departs from the Putra Bridge daily. “The water is clean. That's why they constructed the wetlands, to remove pollutants and to clean the water before it enters the lake,” says Sam. As we stroll along the road at dusk, local and migratory birds flutter and swirl above our heads and squawk at our feet. There are flamingos, storks, African swans, jungle fowls, purple herons, great egrets and birds with names that sound as foreign as the land they come from. It seems like the wetlands have received their stamp of approval from creatures great and small. “We used to hold international bird singing contests here before the bird flu hit,” says Sam, before bidding us goodbye. Back in the city, the buildings take on an ethereal glow as the orange sun sinks below the horizon. Only a few inhabitants retreat into the city's only shopping mall, Alamanda Putrajaya, for dinner. In the deserted food court, the only sounds that are heard are the muffled footsteps of the food vendors who are overcome with restlessness and impatience to go home. “It's not our objective to compete with KL,” says Shukri Hassan, when he welcomes us at the Cruise Tasik Putrajaya terminal for our dinner cruise. As we dine under the stars in a Malaysian version of the bateau-mouche, we pass different architectural landmarks and Arabesque flights of fancy - domes, pavilions, minarets and columns. This is a city that looks and feels more Persian than Malaysian, more Islamic than secular. It is a city that takes some getting used to, but once you walk its boulevards and roam its parks, the stillness that permeates every corner of every street will creep into your veins like a drug. And you will return, time and again, for another hit.